LDL: In the '60s, the American Western was in a crisis. Had the audience grown tired of the upright hero? Duccio Tessari: I should say so! Upright heroes are typically American heroes; originated from a Protestant culture. They are round, complete characters; doubtless. Our horoes, however, are always somewhat defeated heroes. From the beginning, doubtful and perplexed. At first, America was a country where people from different groups lived - Englishmen, Irishmen, Greek, Italian and so on. Then these groups melted together inorder to face the adversities of the new frontier and to defend themselves from the Indians. And then America could be said to be one people, and from them arose the image of the heroic American, upright and invincible. It is highly probable that during the '60s, the American hero was not very popular, but it is clear that such a crisis does not exist now - consider RAMBO. Today the heroic myth rises again. Our Cowboys were rogues, fearful, shot people in the back, and had little in common with the heroic Cowboys - starting with Corbucci's violent ones, to my free and easy ones, and ending with the studied and serious characters of Sergio Leone. 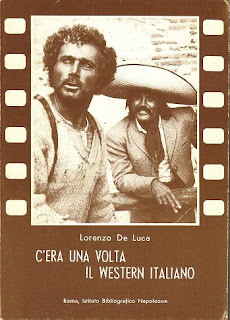 Italian westerns are second to NONE.